As homebuyers rediscover the classic style, comfort and practicality of raised wood floor houses, there is a growing opportunity for home builders to combine traditional architecture with progressive building techniques to create more durable, attractive and faster-selling homes. Visually, a raised wood floor offers historic charm, and—built with the latest advances in wood products and technology—it is a proven building method for most any location and soil condition, especially for high wind and flood-prone areas. With the know-how to properly construct a raised wood floor system, well-informed builders can build homes faster and more cost effectively, all while establishing a reputation for quality and craftsmanship that distinguishes them from the competition. The following case studies, featured in Raised Wood Floors: Case Studies in Progressive Home Construction, Form K110, showcase builders and designers and their best practices for building raised wood floor homes. 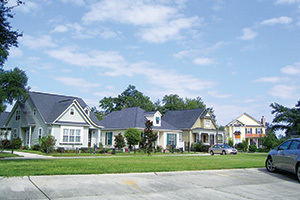 Collier Construction built a traditional neighborhood development in Mississippi that incorporates new and efficient building products while maintaining the character and historical feel of traditional homes. Cooper Homes is a high-end home builder in Atlanta whose raised wood floor homes sell quicker and for more money than houses on concrete slabs. Jeffrey Harrington Homes is a custom home builder in Houston that likes the technical advantages offered by raised wood floor systems, such as the ability to easily level or repair a shifting foundation. See the raised wood floor high-resolution photo gallery. Note that these practices are presented not as APA or Southern Pine Council (SPC) recommendations, but as innovative examples of how contemporary raised wood floor houses are designed and built.